There are two sizes of bulbs in the SR5 gauge, best described as "big" and "small" The "big" ones are about 1/4" in diameter and the "small" ones about 1/8". 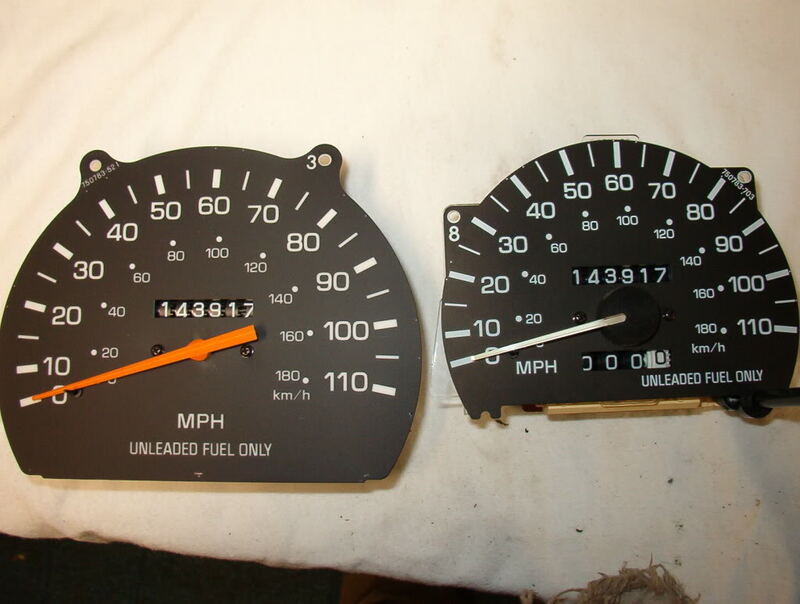 The DLX Gauge only uses the "big" lights, the SR5 gauges use both sizes. The SR5 gauges I bought had only a couple of the smaller lights in it (was short more than a handful required to be fully operational). I had to run down to the local Toyota dealer and jaw-flap with the counter guys until finally one brought out a box of "assorted dash lights" and let me finger through it, flipping out the small bulb+carrier assemblies that I thought would work. 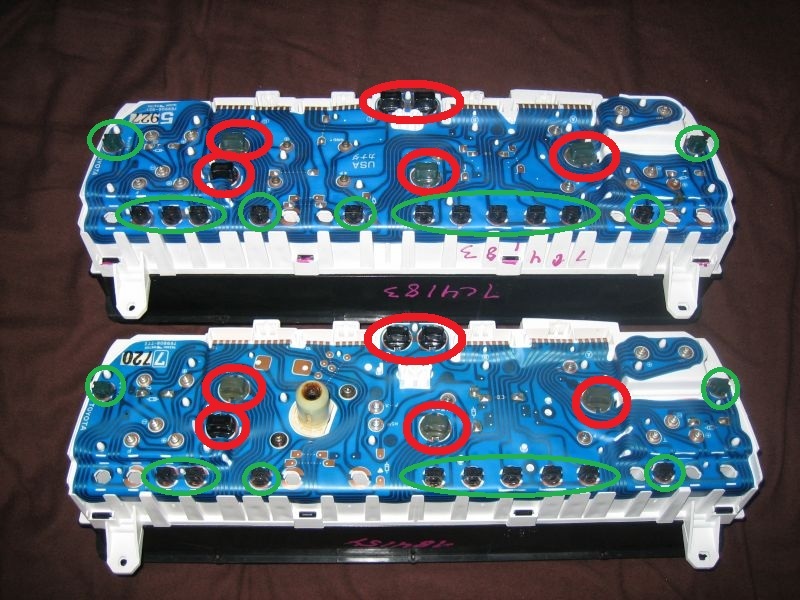 Turns out the plastic carriers are semi-standard, Mazda also used the same basic design in their instrument clusters. Counting the holes above, there are eight (8) small ones, eight (8) clear big ones, and three (3) tinted big ones (the three holes across the center are the ones you tint for instrument cluster color). Some of the idiot lots aren't used from the factory, so not all of these holes are functional. The numbers above are good to use knowing that you'll have some extra. I filled every hole, thinking of the unused ones as "spares" for field emergencies. Last edited by Windsor; 12-21-2009 at 09:26 PM. wow, thanks! what to delux clusters look like, because although I have a delux truck, my cluster looks like the SR5 pics up above. Seen earlier in this thread. 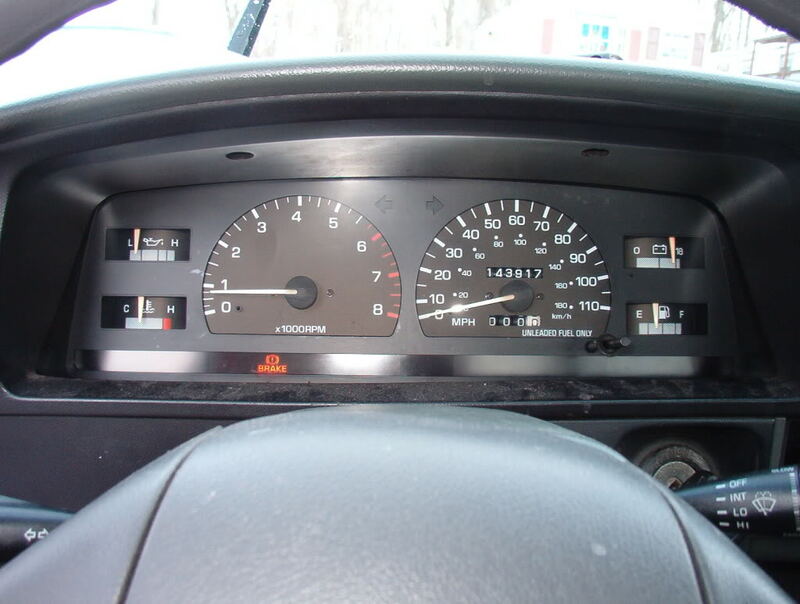 I should point out, my gauges are for '87, whereas superbleeder's are for '91. These are a bit different (compare my photo with other back-shot photos in this thread). The bulb count is probably a bit different from what I posted (sorry about that). my 91 is a Delux per the title, but it was just the standard gauge clusted with the speedometer, temp, and fuel gauge. Last edited by iamsuperbleeder; 12-22-2009 at 02:51 PM. Man that helps ALOT! My cluster is dim at best so I need to replace all of them and just keep the current working ones as spares. I'm guessing that you can buy them in amber also? I'd like to do the cluster and the control panel for the ac/heat in amber since I like that color better. Are the ones behind the "check engine" and others clear and the gauge face colored or are they actually orange/red etc? I can't really pull it apart and then drive down to the auto parts store can I?? It'd be nice to lay the cluster on the counter and just buy what I need instead of guessing. Oh and I looked at my title and my rig is a DLX also but it has the SR5 badges on it. Of course my tail gate is red, the front drivers panel and hood are black (underneath the Royal Blue) so I'm guessing when the PO said it had some minor body damage at one point what he meant was that it was hit hard front and rear. No worries though since it tracks straight and the frame is still the way it should be. Yeah, my photo was for 1st-gen 4Runner. To clarify, I didn't have carriers for the 286 bulbs, which is why I had to head to the Toyota dealer. Last edited by briholt; 12-22-2009 at 04:53 PM. yeah the larger 194 bulbs that are used for back-lighting the gauges will have the green condoms on them to tint the light green, as well as the two outter smaller ones as well. They're not really neccesary, they just give the gauges that original green tint; if you leave them off, they might actually be a bit brighter, but the green tint will go away, and they may actually come off as a little on the yellowish side. You can get amber bulbs to put in there, for the larger 194's for sure; they're used a lot in turn signals and marker lights. The smaller 286 bulbs though, you may have a more difficult time finding those in amber; they're pretty much only used in guage clusters, simply because of their size. I just did a sr5 gauge swap on my 91 22re and everything works but the tach and it doesn't move at all. Does anyone know if I have to run a wire and where from and to? Read posts 39 and 40 on the second page of this thread. They explain this and how to fix it. Follow the links in he posts. 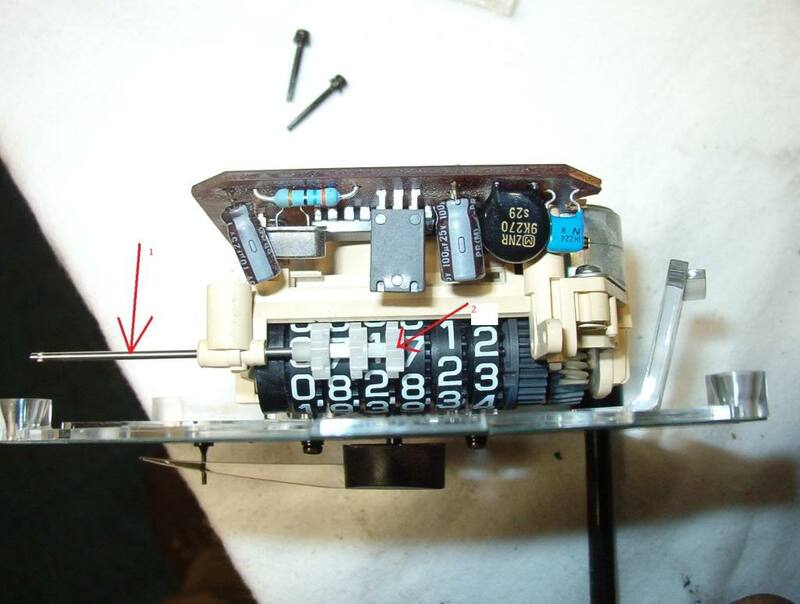 I have checked several posts and it looks like the 22r and the 22 re have different wiring harnesses for the tach and I can't find the tach wire for the 22re. Anyone know were it is? I remember reading somewhere you dont even need the wiring harness. Some came from the factory pre-wired for the tach and some didn't. 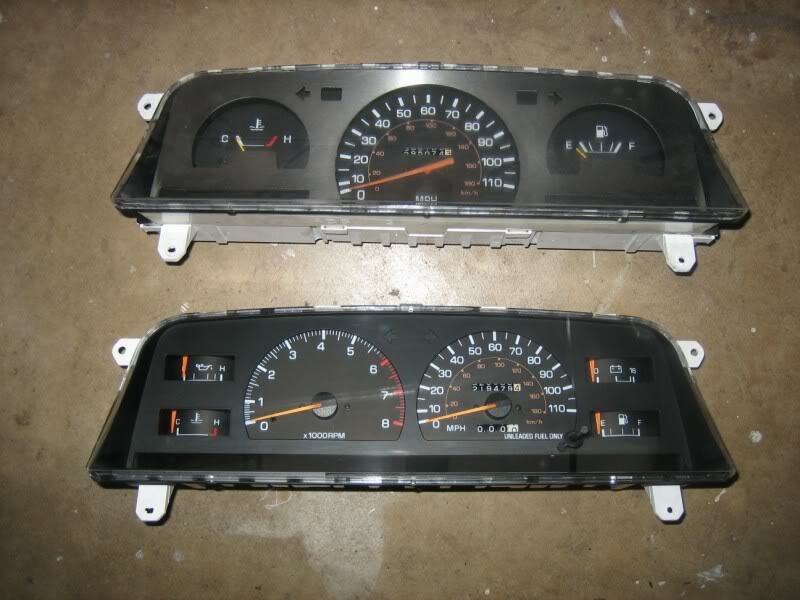 You could hook it up like you would an aftermarket tach gauge. 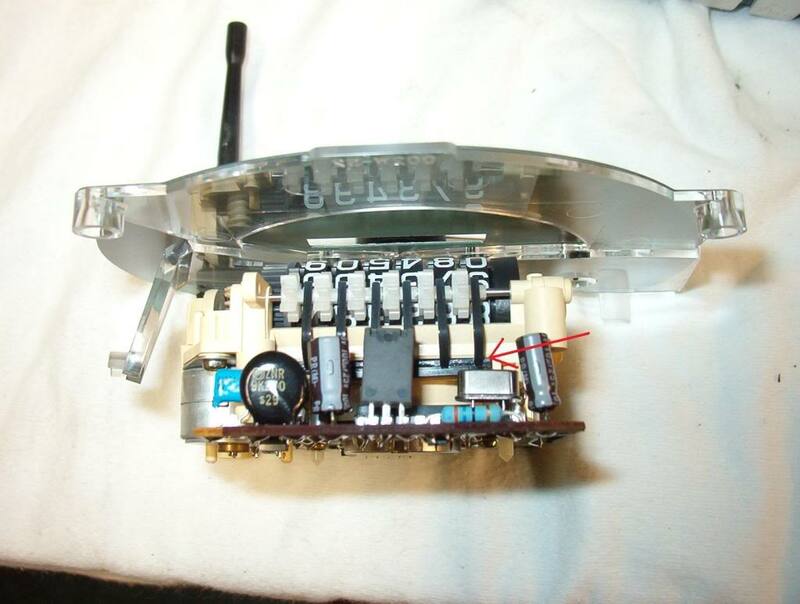 I believe there are 2 or 3 contacts on the back of the tach on the circuit board where you can solder your ground wire and then solder another that you can connect to your ignition coil (I think?). If i remember correctly it doesn't matter which contacts you solder your wires to. Down the pge a little shows the locations of the contacts to attach wires so that you don'the wiring ha need the wiring harness. Last edited by 92 2wd; 01-02-2010 at 08:41 AM. 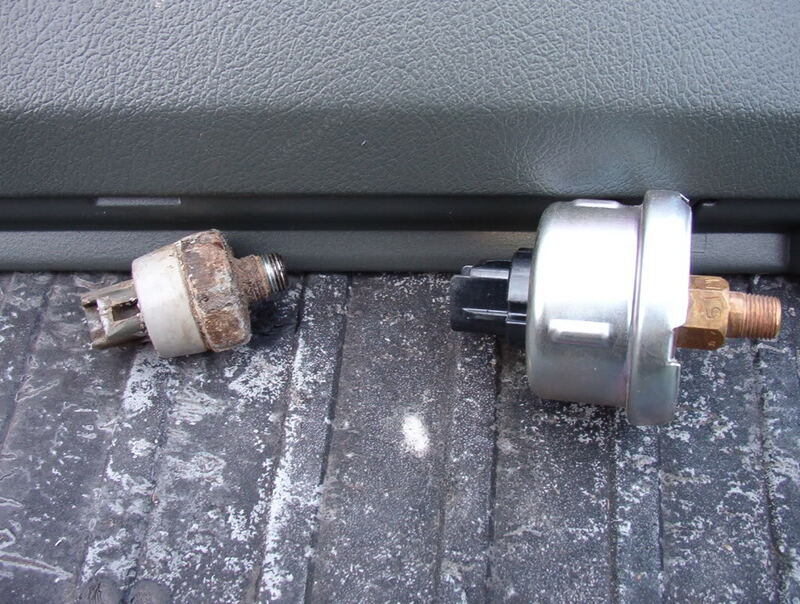 bleeder, do you think that your writeup would be useful in swapping over the gauges in a 95 taco? If you are interested there is another way to change the milage on the register. 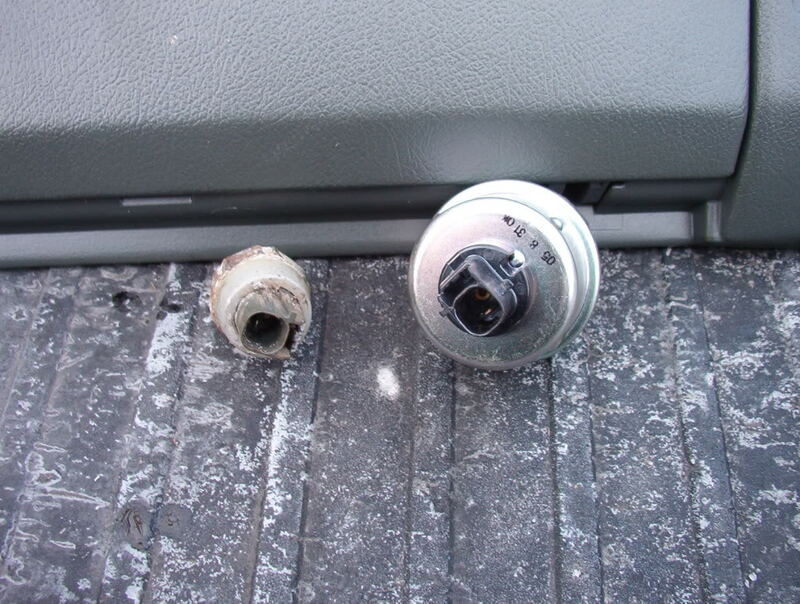 From your first picture where you have the register out of the speedometer assembly and you are looking at the grease spread around you will notice a silver rod that holds the keepers of the number cylinders in place. If you take a pair of needle nose pliers or vice grips and open up the crimps on each end of the rod you can slide the rod out. Then there is enough side play on the number cylinders to readjust your mileage to what your previous cluster was. Re-align the tabs slide the rod back in and recrimp the ends. You don't have to worry about stretching the spring ar breaking the indicator arm. I've done this to several Toyotas over the years and Fords before that, with no problems with the register after this mod. I forgot to add, the number registers are meant to move in only one direction and if you try to turn the numbers back (as was suggested earlier in this post) without doing what I said above you will break the the tabs off and the numbers will show white between the cylinders. If you ever see white between the cylinders of a register you will know immediately that someone has turned it back. Thanks for the great writeup. I'd thought I would add some photos of a electronic odometer swap. I changed my miles this way without removing the speedometer needle. Remove this black finger looking piece first. Just pops right out. You should be able to set the miles to the correct reading by just turning them freely. You'll need some patient putting it back together. Slide the rod back in while placing the white gears on one at a time. Keep checking to make sure the miles are still reading correctly. Put the black finger thing in. 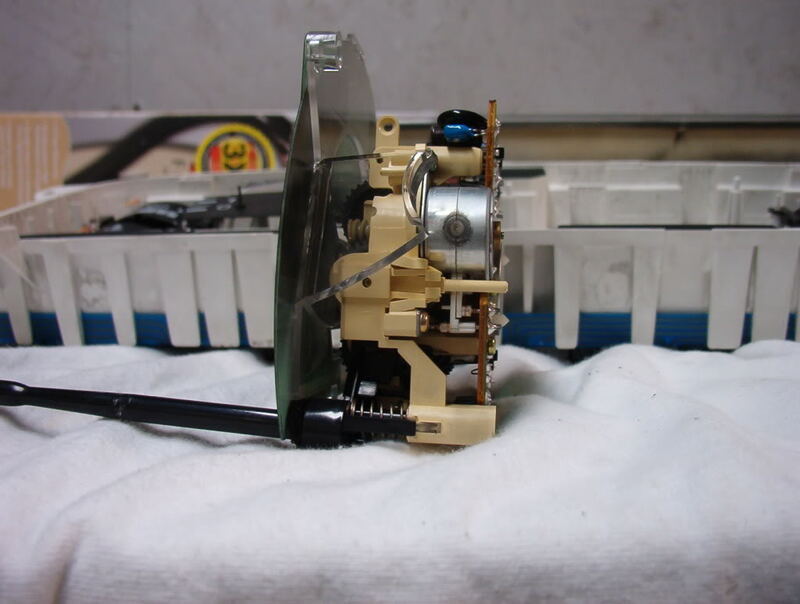 Quick Reply: SR5 Gauge Cluster Swap - How-to, with pics!